Carnatic 101 singing course comprises of the fundamental exercises that are needed to get you started with a lifetime of learning singing in the Carnatic style. It consists of videos introducing you to the concepts of sruti, tanpura, svara and svarasthana, exercises to practise single svaras and sarali svaras of different complexities. 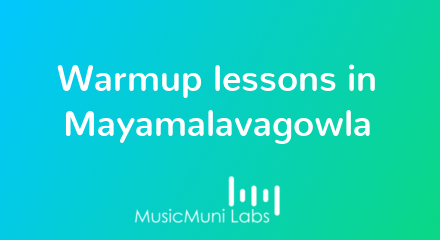 All the exercises are in the scale structure of the raaga Mayamalavagowla. These are the first exercises any student of Carnatic music would practise. Carnatic 101 course with patterns from Mayamalavagowla melakartha raaga. This course consists of the following learning and practice modules. This module contains lessons focusing on the aspects of practicing the prakriti or natural svaras which are the tonic (Sa) and its fifth (Pa) for long durations in order to attain pitch stability and breath control. This module is a perfect starting point for absolute beginers. Sarali svaras are simple patterns of svaras knit together as learning exercises for absolute beginners. This module introduces the following most basic sarali svaras which are very simple to repeat. Each successive sarali pattern focuses on different svaras enabling the student to get a feel for each of the svaras by the end of the module.